I was up at 5 this morning and even before I had my coffee made, this caught my eye and I grabbed my camera and ran outside. 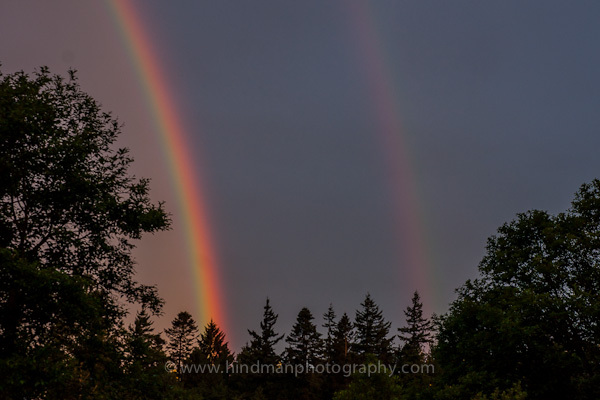 It was a full double rainbow right from my deck. I didn’t have a lens wide angle enough to capture the whole thing. I took lots of photos. It was amazing. I just love surprises like this. 07 Jun	This entry was published on June 7, 2012 at 21:55. It’s filed under Nature, Pacific Northwest, Sky and clouds, Whatcom County and tagged inspiration, rain, rainbow, spring, Whatcom County. Bookmark the permalink. Follow any comments here with the RSS feed for this post.